I am part of an exhibition of 3 artists at The Square Studio, 2 The Square, Northam, Bideford, North Devon EX39 1AR. 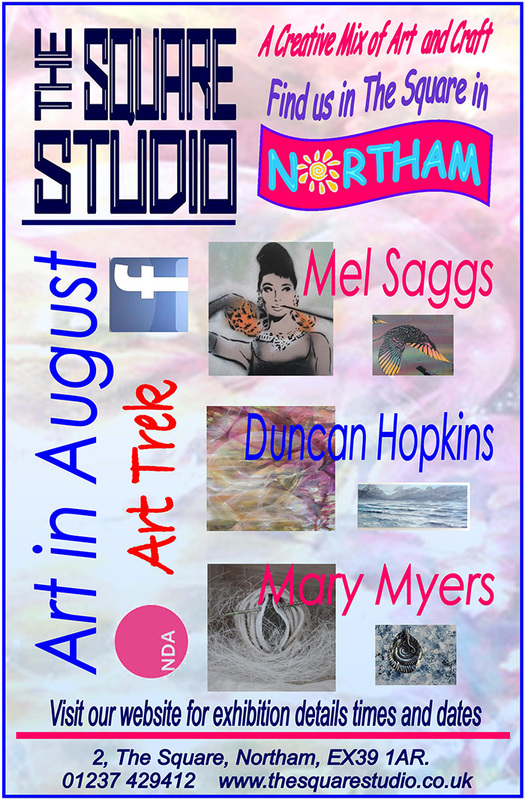 The exhibition runs throughout August, and the featured artists are Mary Myers, Mel Saggs and myself. I thought you might like to know we had great success the past few weeks in Art Trek and we have decided to extend our exhibition changing and adding new works. Mel Saggs of 7thpencil is showing stencilled paintings that were created during the live painting sessions in previous art trek weeks. She will be showing films of the subsequent paintings and other works that have recorded the painting process via time-lapse photography, with soundtracks by local musicians. And also framed up-cycled sculptures made from the fall out of the paintings. Duncan lives in Northam. The recent work in this exhibition reflect his responses to the local Devon landscape and the changing qualities of the sea. Mary, who originally trained as a jeweller in is also a qualified teacher of Metal Clay, a seemingly alchemic process whereby tiny particles of silver are suspended in a clay like binder which can be formed and moulded, but when fired leaves behind just pure silver. Mary`s work and details of classes can be found at the Square Studio and she will be demonstrating it there on Saturday (the August when Mel and Duncan will also be present to discuss their work.